The £50m PFI redevelopment of Liverpool Central Library is completed and the library open to the public, anticipating 1m visitors in its first year. The original library was opened in 1860, and all but the façade destroyed by bombing during the Second World War. It was rebuilt and extended in the 1950s and 1970s. The 1950s Brown Library has been demolished, rebuilt and extended and the 1978 eight-storey extension between the Walker Art Gallery and the World Museum has also been demolished to make way for a new five-storey library constructed behind the Grade II listed historic façade. 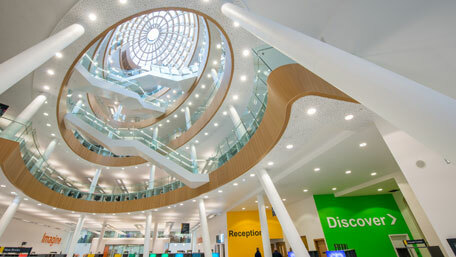 With a stunning new domed atrium and a climate-controlled archive facility, the new library is now home to four million items, double the number of public access computers, new furniture, an entrance café and roof terraces overlooking the city. A bright new children’s library has been created. The visionary restoration has retained and re-used historic features where possible, with the new design elements complementing the historic fabric of the building, yet remaining bold and contemporary in design. The Communications Office for Liverpool City Council has produced a very detailed information pack with photos of the interior and exterior of the new library, which can be downloaded from the link on the right. Download the full profile, with more images of the library.